If an eligible item you bought with PayPal doesn’t arrive, or doesn’t match the seller’s description, we will reimburse you for the full amount of the item including shipping costs. How to file a Buyer Protection dispute. Open a dispute via the Resolution Center. Simply click “Report a Problem” and find the transaction in question. You have 180 days from the date of payment to file your claim. 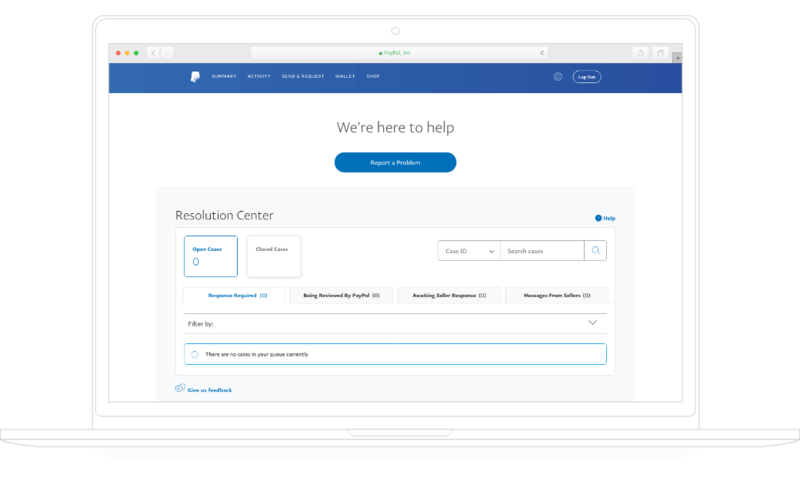 PayPal Customer Support is here to assist you if a problem does arise. We can help you deal with a Buyer Protection claim, suspicious account activity, or a problem with a purchase. If you have a question, please contact us. We’ll email you a receipt confirming payment whenever you pay with PayPal. If you receive an email for a payment you didn’t authorize, contact us immediately. We’ll act fast to secure your account and investigate. Our Buyer Protection Policy helps you in the unlikely event you have a problem with an eligible purchase. If an item doesn’t arrive or match the seller’s description, we’ll help you recover the full purchase price (up to $20,000 USD), including shipping costs.